Orkney Wool over-dyed pure Texel knitting yarn. The wool is selected from the finest fleeces shorn from the shearling Texels on Veltigar Farm, Orkney. 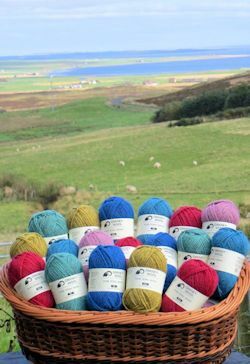 The colours are inspired by the magic of Orkney itself. 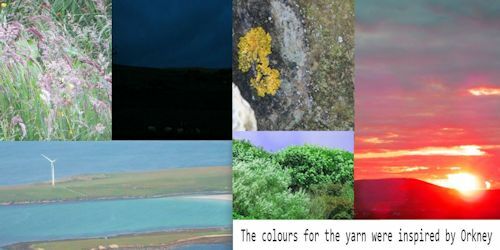 Clockwise from top left: Flowering Grass, Solstice Sky, Stone Crottle, Sunrise Over Gairsay, Wind Blown Trees, Sanday Sea. Two new colours have been introduce for the 2015 yarn. Both inspired by photographs taken at Burnside. Oyster Catcher and Settisgarth Violets.